Altum angelfish originally came from Brazil, Venezuela and Colombia. The word Altum is a Latin word means tall and this fits the fish well because it can grow as 30cm/12” in height and they can get long as 15 cm/6”. This angelfish are the sensitive version of angels. They are not that suitable for keeping as pets because of its timid and sensitive tratots plus they could cost a lot ranging from $20-$50. But if you really into this angel, then you must prepare to pay for this amount to acquire this sensitive angel. The suitable and normal rtange of ph for its water is 4.5-6.5 plus they prefer warmer water with temperature of 28-30C/82-86F. Altum Angelfish is one of the largest and colorful cichlids. They are known for its timid traits that even a small shadow could frighten them. Though they are timid and a bit frightened, when they start to get accustomed to its surroundings, they can be good pet fish. But this fish is not that friendly to smaller fishes in the reefs though they may join the school of other fishes, they still get aggressive and very territorial as they grow older and when they in the breeding stage. It was in the early 1900’s when the first altum angelfish was introduced and establish in America. There have been numerous colors and patterns available in every pet shop, retailers and wholesalers since then. 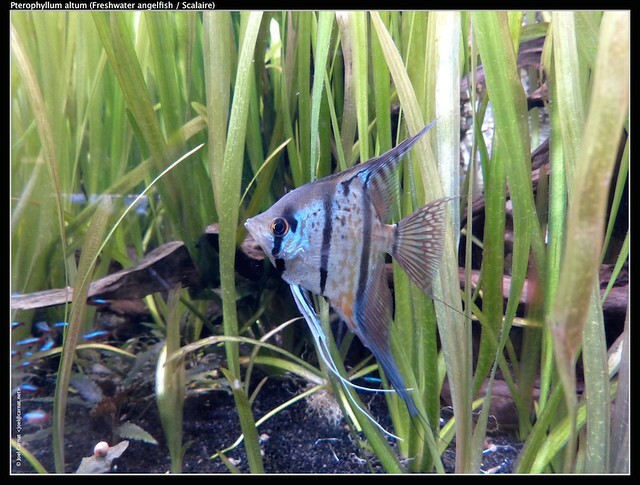 Altum Angelfish has a habit of always yawning. Their mouths are larger than any angels. These fishes are very rare and most of the times, you will notice some defects on their skin on a pet shop because of the shipping and sometimes because of the fighting scene from other predators. You will also notice some black pepper like sprinkles on their skin. This is an infection called black spot disease. Adult altum can grow up to 13 to 15 inches or more. You must provide a large and spacious tank or aquarium for them. When it comes to altum angelfish diet, this specie is not picky eater. They most especially like to feed on mosquito larvae, blood worms, Daphnia and some live brine shrimp. They prefer these foods to be frozen first. Make sure to feed them once a day then leave one day out before you feed them again to make sure that they really digested it all. Brine shrimp can also help their digestions and can even prevent constipation. Altums also like to eat the substarte on their tanks which can injure their delicate mouths Though most cichlids are peaceful, altum can be quite aggressive and territorial when it comes to space on their tanks. Make sure to use coarse gravel with more rounded edges to prevent this harm to happen to your altums. By William Ousley is a angelfish expert.